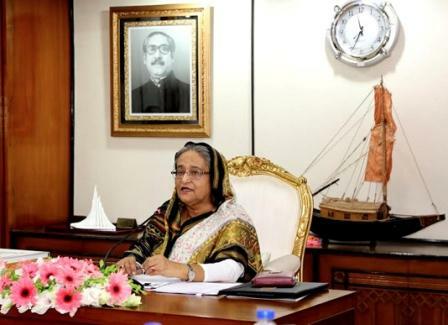 Staff Correspondent: Prime Minister Sheikh Hasina on Thursday asked the authorities concerned to take development projects in such a way so that the people are not affected due to it. The prime minister made the remarks during the presentation of Moheshkhali-Matarbari Integrated Infrastructure Development Initiative (MIDI) Project at the Prime Minister’s Office this morning. While talking about the development of Cox’s Bazar, Sheikh Hasina said the coastal district was once very neglected and its people used to lead an inhuman life. Pointing out a huge potentiality of Cox’s Bazar, the prime minister said the world’s largest unbroken sea beach is situated in this district. “Centering Cox’s Bazar, we’re setting up an economic zone side by side with developing it as a tourist hub,” she said. They said Bangabandhu Sheikh Mujib Industrial Estate (Feni Economic Zone, Mirsarai Economic Zone, Sitakundu Economic Zone), Moheshkhali-Matarbari Integrated Infrastructure Development Initiative (MIDI) Project and Sabrang Eco Tourism Park have been included in the corridor.